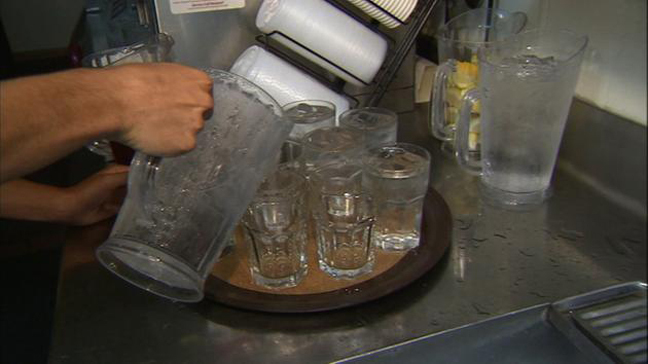 Patrons of Southland restaurants and eateries across the state will soon have to request a glass of water, while hotel guests will be able to re-use linens and towels under restrictions approved this week by the State Water Resources Control Board in an effort to combat California’s crippling drought. The board also mandated restrictions on watering yards and landscapes, although most local water agencies already have such restrictions in place. The Los Angeles Department of Water and Power already restricts irrigation of yards to three days a week. Under the action taken by the state board today, agencies that don't have irrigation restrictions in place will have to limit outdoor watering to no more than two days per week. The new state regulations, which take effect in 45 days, also ban watering yards within 48 hours of “measurable precipitation.” They also require restaurants to serve water only on request, while mandating that hotels offer guests the option of not having their towels and linens washed daily. The heads of local water-conservation groups said the regulations are a positive step, but said there needs to be stricter enforcement to ensure residents are complying.